Miscellaneous. 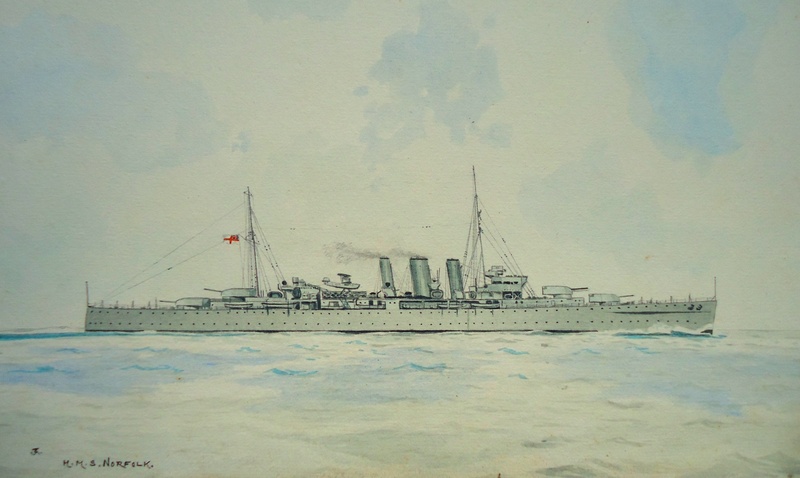 watercolour annotated by the artist (lower left) HMS NORFOLK and with a monogram "AJ". HMS NORFOLK and her sister DORSETSHIRE were half sisters of the Kent and London classes and all were commonly called the County Class: mounting 8 inch guns (eight in four twin turrets) they were classified as heavy cruisers. The class numbered 13 (including AUSTRALIA and CANBERRA who were built for the Royal Australian Navy) and started appearing at sea in the late 1920s and the last two, NORFOLK and DORSETSHIRE, incorporated many of the lessons learned from experience at sea with the earlier ships. This watercolour appears to show NORFOLK in the early 1930s (the aircraft and catapult - shown here - were fitted in 1932-33) and during subsequent refits leading up to the outbreak of war in 1939 all ships of the County class received, amongst other modifications, increments to their light anti-aircraft outfits and communiucation and signalling equipments. By May 1941 when NORFOLK and SUFFOLK were stationed in the Denmark Strait to cover against the German battleship BISMARCK and her consort the heavy 8 inch cruiser PRINZ EUGEN breaking out into the Atlantic, these modifications included early types of radar, NORFOLK's being distinctly "earlier" - and very inferior - to SUFFOLK's. It was the latter who first detected BISMARCK and PRINZ EUGEN (though paradoxically with a seaman lookout's Mk 1 eyeball and not her radar!) although it was NORFOLK's sighting report that was the first indication to the Commander-in-Chief Home Fleet that the German ships had been re-located. The two cruisers went on to conduct a brilliant shadowing operation maintaining contact with a very angry German squadron, coming under sporadic "keep away" fire and in very difficult weather conditions for some 36 hours which was subsequently held to be a model, a classic, of its kind. NORFOLK ended her days nine years later in a Welsh shipbreakers.